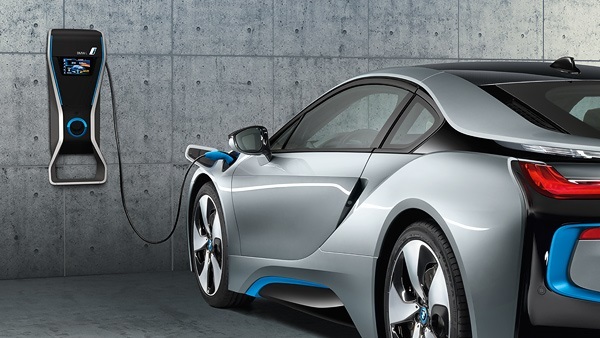 Find out about the BMW i8 plug-in Hybrid Electric Car, EV. Taken a look at the BMW i8 Plug-in Hybrid Electric Car, this fantastic EV can do 0-62 in 4.2 seconds. Prepare yourself to be amazed by the i8's performance. Find a BMW i8 for sale today. The BMW i8 is a German made plug-in hybrid electric sports car, the first hybrid sports car from BMW. The German giants have revolutionised this vehicle class of sports car, with the plug-in hybrid eDrive from the electric motors and the 1.5 litre three-cylinder petrol engine working together as one. This logical and intelligent energy management system coordinates between the battery and the electric motors. This along with the combustion engine is then geared towards the pure maximum performance while saving on the consumption of fuel that it takes in. As a result of this, BMW have produced a powerful and yet a very efficient plug-in hybrid sports car. In 2008 BMW launched their Project I, one year later the EfficientDynamics concept had been shown to the world. This was the basis of the BMW i8 concept that hit the world stage nearly pre-production-ready. All available BMW EfficientDynamics technologies were already united within this vehicle, an intelligent lightweight concept had been implemented, and the idea of a sports car for the future became a reality. The shape of the BMW i8 follows a new and unique design concept, not previously seen from BMW but may feature in the future as part of future ‘I’ range vehicles. The cuts, curves and the wide framed body, not only make the i8 look unique, they also are designed around the aerodynamics and handling of the vehicle. The i8 also features LED daytime running lights with a distinctive U-shape and has laser light technology that considerably increase the range of visibility. Another key feature of the i8 are the spectacular dihedral doors, these doors are opened upwards, made possible by the lightweight materials used. When the doors are closed they perfectly blend into the aerodynamic body, the doors are approximately 50% lighter than conventionally built doors. BMW used sustainable, renewable and lightweight materials where possible that also helps reduce their carbon footprint. The BMW i8 has a very new and fresh sporty look, like no other car on the market. The cockpit has a large LCD monitor on the centre console where you can see what the car is doing from the stereo, A/C to how many mpg you are getting and to how much battery range you have left. The bucket sports seats will keep you nice and firm when driving fast or slow. The centre console is aimed towards the driver, for total comfort when driving. You also have the auto gears, A/C, cup holders and much more inside the i8. Nice fat 20 inch BMW i Turbine-spoke style 444 alloy wheels with mixed tyres. BMW 1.5 TwinPower Turbo three-cylinder in-line petrol engine with EU6 emissions management system. Li-Ion Battery, 7.1kWh gross / 5.1 kWh Battery of which the average charging time is around 2.5 hrs. Hybrid-specific all-wheel drive where by, the combustion engine drives the rear wheels and the electric motor drives the front wheels. As with most electric or hybrid cars you get can get a great smartphone app. With the BMW i8, it lets you view information regarding your vehicle status, from the charge of the high voltage battery and when it is fully charged to the efficiency and mobility of the car, all this can be displayed on your Smartphone or Tablet. Warm up the i8 before you even get into it, or on a hot day why don't you cool it down by turning on the A/C via the app. Find a BMW i8 for sale here! Want to know more about Electric Cars or Electric, Hybrid & Eco Car Manufacturers?